Head lice are tiny insects that live on people's heads. Adult lice are about the size of sesame seeds. The eggs, called nits, are even smaller - about the size of a dandruff flake. Lice and nits are found on or near the scalp, most often at the neckline and behind the ears. Head lice are parasites, and they need to feed on human blood to survive. They are one of the three types of lice that live on humans. The other two types are body lice and pubic lice. Each type of lice is different, and getting one type does not mean that you will get another type. Lice move by crawling, because they cannot hop or fly. They spread by close person-to-person contact. Rarely, they can spread through sharing personal belongings such as hats or hairbrushes. Personal hygiene and cleanliness have nothing to do with getting head lice. You also cannot get pubic lice from animals. Head lice do not spread disease. Children ages 3-11 and their families get head lice most often. This is because young children often have head-to-head contact while playing together. Sores from scratching. Sometimes the sores can become infected with bacteria. A diagnosis of head lice usually comes from seeing a louse or nit. Because they are very small and move quickly, you may need to use a magnifying lens and a fine-toothed comb to find lice or nits. What are the treatments for head lice? Treatments for head lice include both over-the-counter and prescription shampoos, creams, and lotions. If you want to use an over-the-counter treatment and you aren't sure which one to use or how to use one, ask your health care provider or pharmacist. You should also check with your health care provider first if you are pregnant or nursing, or if you want to use a treatment on a young child. Apply the product according to the instructions. Only apply it to the scalp and the hair attached to the scalp. You should not use it on other body hair. After each treatment, check your hair for lice and nits. You should comb your hair to remove nits and lice every 2-3 days. 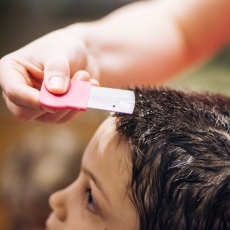 Do this for 2-3 weeks to be sure that all lice and nits are gone. All household members and other close contacts should be checked and treated if necessary. If an over-the-counter treatment does not work for you, you can ask your health care provider for a prescription product. If your child has lice, be sure to check the policies at school and/or daycare. Your child may not be able to go back until the lice have been completely treated. There is no clear scientific evidence that lice can be suffocated by home remedies, such as mayonnaise, olive oil, or similar substances. You also should not use kerosene or gasoline; they are dangerous and flammable.